Irish soda bread is a bread made with baking soda as a leavening agent instead of yeast. Traditional soda bread is made with flour, baking soda, salt, and buttermilk. Through the years (and quite controversially to soda bread purists) the addition of eggs, nuts, or dried fruits has become common. I respect the history of the dish, I recognize it is from a simpler time, but I'm going to make it with additional ingredients. Purists be warned! Preheat the oven to 425°. In a large mixing bowl, whisk together 4 cups of flour, sugar, salt, and baking soda. Using a pastry cutter (or two knives), work the butter into the flour until it resembles coarse meal. Stir in the raisins and make a well in the center of the mixture. Add the beaten egg and buttermilk to well and mix with a wooden spoon until the dough is too stiff to stir. (*Note - if you do not have buttermilk simply add about 1 Tbsp white vinegar or lemon juice to each cup of milk and let sit a few minutes to thicken.) Dust your hands with flour and taking care not to over-knead, form a rough ball. If the dough is too sticky, add up to 1/2 cup more flour. The dough should be a little sticky and shaggy, resembling biscuit dough. Transfer the dough to a lightly floured surface and work just enough until it comes together. Form into a round loaf. Move the dough to a large, greased cast-iron skillet or baking sheet (I used a pie tin with venting holes, a gift from the lovely Laura). Using a knife, score an X in the top of the dough about 1 1/2" deep. Let cool 5-10 minutes before slicing. Best when eaten shortly after baking, I have read it does not keep very well. This was tastier than I expected it to be. A hint of sweetness, but still very much a savory bread. Johnny deemed it "incredible." We each had 3 huge slices (almost half of the loaf) in one sitting alongside the ever-scrumptious New England boiled dinner. yummmmy!!! 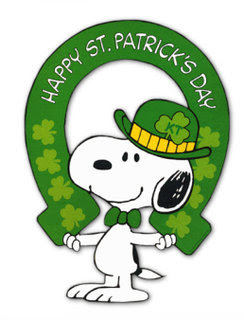 this looks delish.. im only a tiny bit irish.. so i dont really celebrate but oh well!! its still a good excuse to wear a green shirt! That's so funny that we each made that for the first time! I don't blame you Maggie - it's delicious!! Michelle I hope you tackle it, it was really easy and WORTH IT! haha Yeah it was great Jenn! I laughed when I saw it on your page! :) Great minds, right?! YUMMY!! I could eat the whole loaf by myself. I'm baking this next! Ah, I'm most interested in that little crunchy burnt bits on top. am I weird for loving burnt bits the most? Oh, I made your banana muffins again today, lol. They were just too good! I wanted to take a pic of them but they were gone already. I approve! I have had soda bread from a true Irish gentleman and it had raisins in it. They were the best part!! 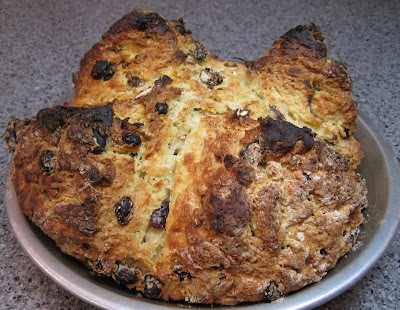 For some reason I was expecting to come to your blog after St. Paddy's day and see a picture of you in a Leprechaun hat or something :) But of course, I will settle for this yummy Irish Soda Bread - something I have never made. I better get on it! You never miss a holiday - I love it! Yes, I love Irish soda bread! Yours looks even better than my previous versions - look at that browned crust! I like savory breads with a hint of sweetness, too - yum!